Obesity is a major public health problem In Australia. More than one in four adults are now classified as obese, up from one in ten in the early 1980s. And about 7% of children are obese, up from less than 2% in the 1980s. Obesity not only affects an individual’s health and wellbeing, it imposes enormous costs on the community, through higher taxes to fund extra government spending on health and welfare and from forgone tax revenue because obese people are more likely to be unemployed. In our new Grattan Institute report, A sugary drinks tax: recovering the community costs of obesity, we estimate community or “third party” costs of obesity were about A$5.3 billion in 2014/15. We propose the government put a tax on sugar-sweetened beverages to recoup some of the third-party costs of obesity and reduce obesity rates. Such a tax would ensure the producers and consumers of those drinks start paying closer to the full costs of this consumption – including costs that to date have been passed on to other taxpayers. There is the added benefit of raising revenue that could be spent on obesity-prevention programs. The scope of our proposed tax is on non-alcoholic, water-based beverages with added sugar. This includes soft drinks, flavoured mineral waters, fruit drinks, energy drinks, flavoured waters and iced teas. While a sugary drinks tax is not a “silver bullet” solution to the obesity epidemic (that requires numerous policies and behaviour changes at an individual and population-wide level), it would help. Why focus on sugary drinks? Sugar-sweetened beverages are high in sugar and most contain no valuable nutrients, unlike some other processed foods such as chocolate. Most Australians, especially younger people, consume too much sugar already. People often drink excessive amounts of sugary drinks because the body does not send appropriate “full” signals from calories consumed in liquid form. Sugar-sweetened beverages can induce hunger, and soft drink consumption at a young age can create a life-long preference for sweet foods and drinks. We estimate, based on US evidence, about 10% of Australia’s obesity problem is due to these sugar-filled drinks. Many countries have implemented or announced the introduction of a sugar-sweetened beverages tax including the United Kingdom, France, South Africa and parts of the United States. The overseas experience is tax reduces consumption of sugary drinks, with people mainly switching to water or diet/low-sugar alternatives. There is strong public support in Australia for a sugar-sweetened beverages tax if the funds raised are put towards obesity prevention programs, such as making healthier food cheaper. 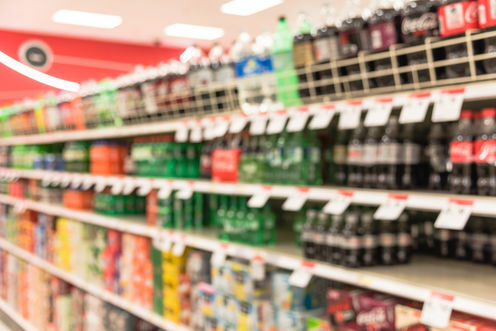 Public health authorities, including the World Health Organisation and the Australian Medical Association, as well as advocates such as the Obesity Policy Coalition, support the introduction of a sugar-sweetened beverages tax. We advocate taxing the sugar contained within sugar-sweetened beverages, rather than levying a tax based on the price of these drinks, because: a sugar content tax encourages manufacturers to reduce the sugar content of their drinks, it encourages consumers to buy drinks with less sugar, each gram of sugar is taxed consistently, and it deters bulk buying. The tax should be levied on manufacturers or importers of sugar-sweetened beverages, and overseas evidence suggests it will be passed on in full to consumers. 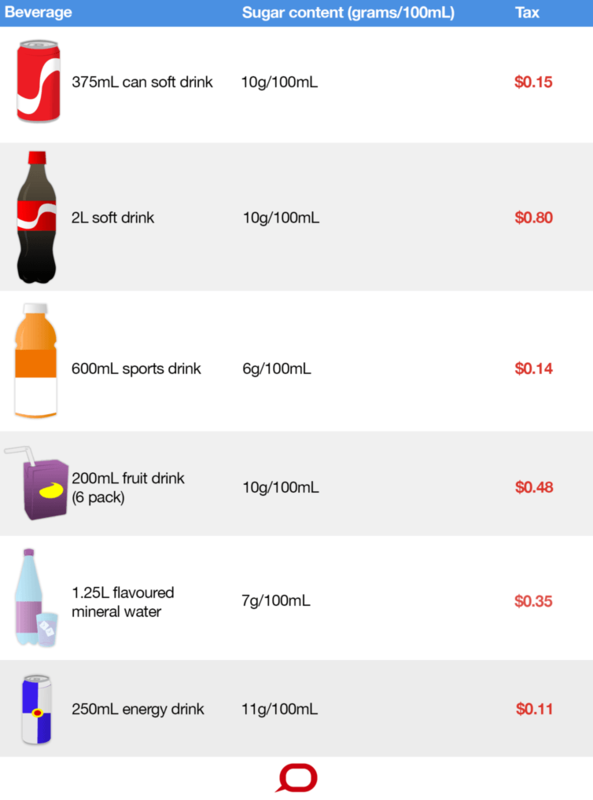 We estimate a tax of A$0.40 per 100 grams of sugar in sugary drinks, about A$0.80 for a two-litre bottle of soft drink, will raise about A$400-$500 million per year. This will reduce consumption of sugar-sweetened beverages by about 15%, or about 10 litres per person on average. Recent Australian modelling suggests a tax could reduce obesity prevalence by about 2%. Low-income earners consume more sugar-sweetened beverages than the rest of the population, so they will on average pay slightly more tax. But the tax burden per person is small – and consumers can also easily avoid the tax by switching to drinks such as water or artificially sweetened beverages. People on low incomes are generally more responsive to price rises and are therefore more likely to switch to non-taxed (and healthier) beverages, so the tax may be less regressive than predicted. Although a sugar-sweetened beverages tax may be regressive in monetary terms, the greatest health benefits will flow through to low-income people due to their greater reduction in consumption and higher current rates of obesity. The revenue could also be spent on obesity programs that benefit the disadvantaged, reducing the regressivity of the tax. While the beverage and sugar industries are strongly opposed to any tax on sugar, their concerns are overblown. Most of the artificially sweetened drinks and waters, which will not be subject to the tax, are owned by the major beverage companies. A sugar-sweetened beverages tax will reduce domestic demand for Australian sugar by around 50,000 tonnes, which is only about 1% of all the sugar produced in Australia. And while there may be some transition costs, this sugar could instead be sold overseas (as 80% of Australia’s sugar production already is). A tax on sugary drinks is a public health reform whose time has come.